Bruce is on a fourth date with Veronica Thomas (“almost engaged” according to Alfred). They’ve taken Veronica’s son Justin to a Gray Ghost festival. When they leave, an armed robber mugs them. Bruce gets Veronica and Justin to safety, while he leaves to pursue as Batman. Veronica, not knowing the truth, is visibly upset. Meanwhile, the mugger meets with his fence. He’s about to sell the contents of the wallets when Batman arrives. He escapes with the mugger in tow. 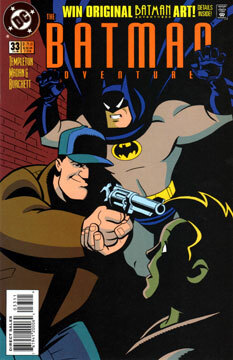 Batman leaves the mugger in the care of Detective Bullock, and then returns Veronica’s and Justin’s things to them, as Batman. He later calls Veronica, as Bruce, but she’s so upset, she ends the relationship. Batman points out to Alfred that this was a happy ending: the thief was captured and nobody got hurt. Yet clearly Bruce lost something. Not a bad little “civilian” tale. Not the best, but it was nice to see Bruce/Batman act on emotion protecting someone close to home. Dev Madan is back on pencils, doing his excellent Parobeck/Timm imitation. He’s excellent at dynamic batman poses. His Bullock is a little off, though.